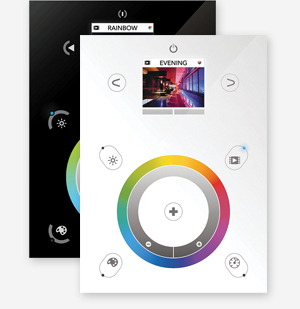 DX Lighting offers simple solutions for control over your environment. All of our lights are compatible with industry standard 0-10V and TRIAC dimmers, allowing you to adjust the brightness to your desired setting. For maximum control, we provide a selection of DMX, wireless and gadget compatible remotes. Custom lighting programming is available via DMX and Radio signal set-ups for unique and powerful light shows. DMX control is used to create the most exciting and extravagant light shows. The possibilities are virtually limitless; you can create a custom light program for every day of the week, weather pattern, or simply to match any mood or occasion. With 1024 DMX output channels, you have the power to store and control up to 10-zones and 500 different scenes with our USB DMX-512 controller. DMX Decoders are sold separately. An app is available for control via iOS and Android devices. 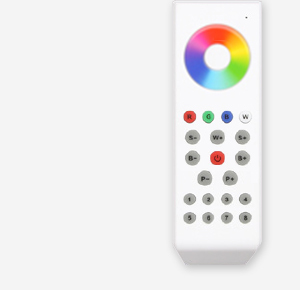 The Wizard controller allows the ability to combine the use of RGB and White Light with the Aurora Series LED strip. 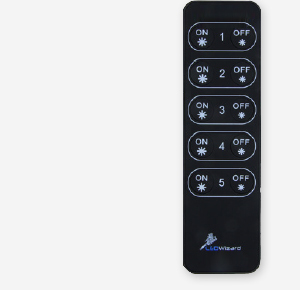 This remote is able to control up to 10 different areas at the same time. You can create multiple color combinations to match your desired look. 5A Receivers are sold separately. Controller includes a white wall holder. Luna is a simple to use LED lighting control that allows for 0-100% dimming. This controller is compatible with any of our White Series LED strips and can control up to 5 individual zones. Receivers are sold separately. Controller includes a black wall holder. The selection of our control options can be made when requesting a quote or inquiring about specific solutions for your project needs. Our team is ready to assist you with a custom set up for how to control your lighting. We walk you through the initial vision for how everything works, to the actual installation and wiring of the selected products.